The Gold Press Program has been in operation since October 7, 1986. IFPO Photographers and Journalists have succeeded more than 85% of the time since then for all kinds of events around the world using this program. Members carrying the Gold Press credentials are on assignment for Today's Photographer International magazine. The Gold Press program is backed up and supported by the editorial staff of the magazine. All the photos and articles in the magazine are by IFPO Members. Photographers and Journalists retain all rights to their photos and articles and are encouraged to also submit their work to other media outlets. Members choose their own assignments. Most of the time you can arrive at the press gate 30 minutes prior to a event, show your credentials and pass through. For high profile events, the editors of Today's Photographer magazine will write letters of assignment or submit applications on your behalf to help you gain access. 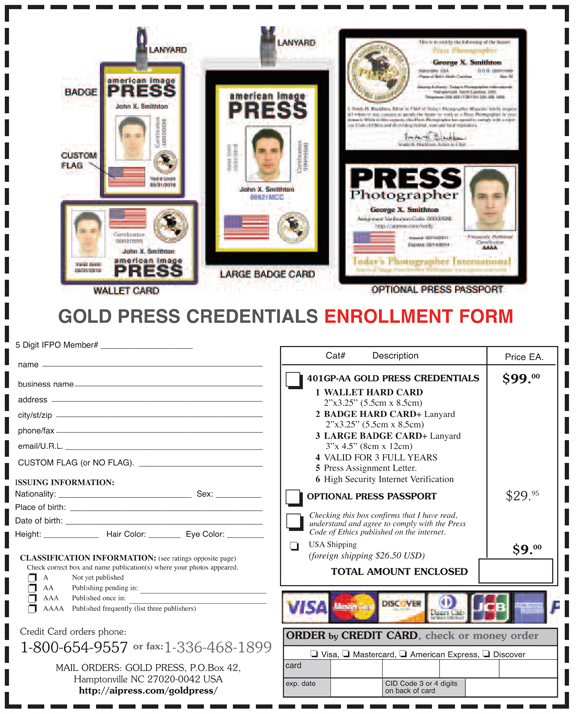 The Gold Press Program is for IFPO members only. Membership is Open to Everyone. Lifetime IFPO Membership is $84. IFPO membership application and enrollment in the Gold Press Program may be made at the same time. Press credentials are issued for 3 years. At the end of 3 years renewal fees are usually half price or less for the next 3 years. Internet Verification is a vital part of the press credential program. The verification site is designed to be maintained by the member who also controls access to the site. Hard Cards are made from high quality plastic like your Driver's License or Credit Cards. Your photo is manufactured into the cards. Official Letter of Certification placing you on assignment for American Image Press and Today's Photographer International magazine. A+ Highest Better Business Bureau Rating. ***CUSTOM FLAG or specify "No Flag". Flags Available: All Country Flags, USA State and Canadian Province Flags, UN and EU Flags. 4. JPG FORM below, or PDF FORM. CONTACT: Vonda Blackburn homeoffice@ainewsservice.net or call me at 1-800-654-9557.